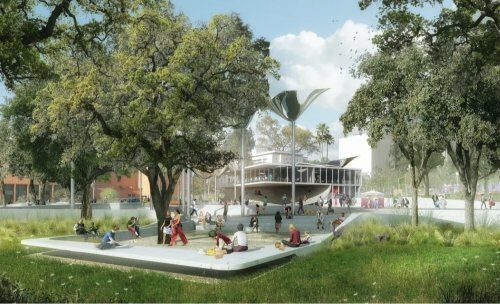 VIEW: The Winning Design for DTLA’s Newest Park, Opening in 2019 — right next to Grand Park! 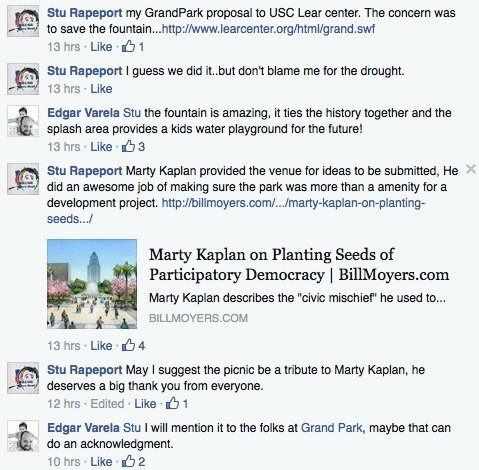 Then CHECK OUT the amazing plans the new park’s design team, Mia Lehrer & Associates, submitted to Grand Intervention for Grand Park. Grand Intervention, beginning in July 2005, worked to maximize public input into the design of a new 16-acre civic park on Grand Avenue in downtown Los Angeles.Using live webcasts of community workshops, online discussion boards, a 3-D landscape visualization tool developed for the project, course charettes and an information-rich website, the project’s goal was to encourage more competitive ideas in the development of this publicly-owned space, from design professionals and ordinary citizens alike. To that end, the Lear Center, in partnership with the Los Angeles Times, conducted an unauthorized design competition which resulted in over 300 submissions from around the world. The park is proving to be wildly popular, and has become a favorite gathering spot downtown. 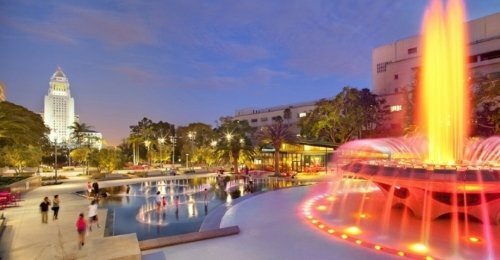 From crowds watching election results on huge screens in the park to the ongoing public programming by the Music Center, Grand Park has taken its place as one of the city’s cultural landmarks. Here’s a recent shout out (click for larger image). Download a one-sheet primer on how to use Grand Intervention lessons in your community. Here’s video of the opening celebration in July 2012.